This is my guide for the Colombian eBay, how to get global shipping to Colombia and South America, and use the website both in English & Spanish. 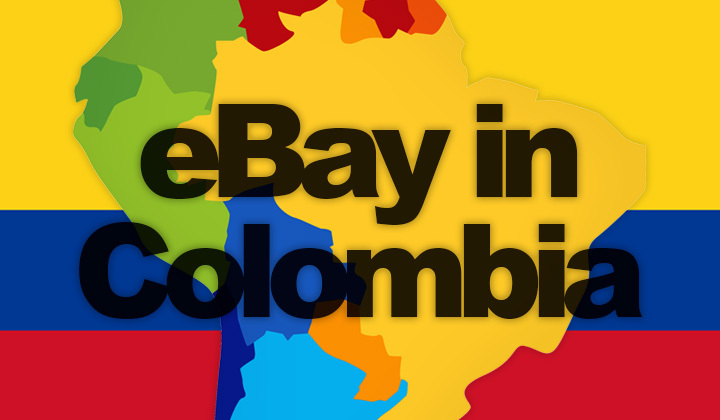 Access the English version of eBay for Colombians with this link — or you can also swap the language between Spanish & English if you are in South America. Step 1. Search for the globe icon in the top menu. Step 2. Click on either where it says “Español” or “English”. Step 3. You’ll see a menu where you can change the language. There are a few simple tricks to getting eBay work for shopping & auctioning when you are located in Colombia, Bogotá or need shipping to the country. But what eBay is best for, are the global e-commerce features where you can compare pricing and availability from sellers all over the world. With maybe not free, but often surprisingly affordable global shipping options from Asia for example. Follow the below steps for a more customized shopping experience! Step 2. Choose the “Advanced” link, next to Search button. Step 3. Scroll down until the “Location” settings. Step 4. Choose the country as Colombia in “Located in” menu. Even though you can narrow down your search to a broader location such as North American, Asian, Europe, etc. unfortunately there is no simple way to shop only amongst South American sellers with one single search. However, when your internet connection is located in Colombia, it will attempt to prioritize results that are nearby. Also you can select a range in Kilometers and set other useful options in the advanced search settings of eBay. You can also use the above method to search from other nearby countries individually, such as Panama, Venezuela, Ecuador, Peru, Bolivia, Brazil, Chile, Argentina, Paraguay, Mexico, etc. however this can be a lengthy process. Equally one method to reach buyers in Colombia is through eBay, with a familiar English language interface. Discover their global shipping program for international shipping, and sending solutions to Colombia. The global version of eBay automatically detects your location and those in Colombia or other Spanish speaking countries in South America will automatically see the Spanish version of the website. Those who need English can change the language from the top menu. However, if you are in the USA or other non-Spanish speaking country there is simply no easy way to see the site’s Spanish version. One will need an IP address from such a location, number used to identify internet connections. If you are looking for other equivalent sites or eBay like shopping and auctioning portals, your best option will be “Mercado Libre Colombia” which is a company owned by eBay and operates throughout South America. It’s more a local shopping experience, both companies and individuals can list items there. Also the website is strictly in Spanish only. Vehicle Accessories, Animals and Pets, Babies, Ballots for Shows, Cameras and Accessories, Cars, Motorcycles, Cell Phones and Telephones, Collectibles and Hobbies, Computing, Consoles and Video games, Sports and Fitness, Home appliances, Electronics, Audio and Video, Tools and Construction, Home and Furniture, Industries and Offices, Estate, Musical instruments, Games and toys, Books, Magazines and Comics, Music, Movies and Series, Watches and Jewels, Clothes and accessories, Health & Beauty, Services, And other categories..! Any questions welcome on online shopping & auctioning in Colombia. Hopefully this Colombian eBay guide was useful and please share! And lastly a notice of monetary nature, that these guides and other posts on the blog are occasionally containing affiliate links which can result into a form of voluntary support for the author and website activities. Biggest sincere thanks, David.